According to an announcement the agency posted to Facebook, 36-year-old Trooper Gerald Ellis was transported to a local area hospital with life-threatening injuries. He died shortly thereafter. Image courtesy of Illinois State Police / Facebook. A trooper with the Illinois State Police was killed early Saturday morning when he collided head-on with a driver traveling eastbound in the westbound lanes of an interstate highway. ISP Acting Director Brendan Kelly said in the Facebook post, "While the men and women of the Illinois State Police are still grieving our recent loss, it is with profound heartache and unfathomable sadness that we inform you of the death of another fallen trooper, Trooper Gerald Ellis. Trooper Ellis laid down his life while protecting the citizens of this state. We are asking the public to respectfully give consideration to the family of Trooper Ellis and the ISP while we continue to process and work through this tragedy." 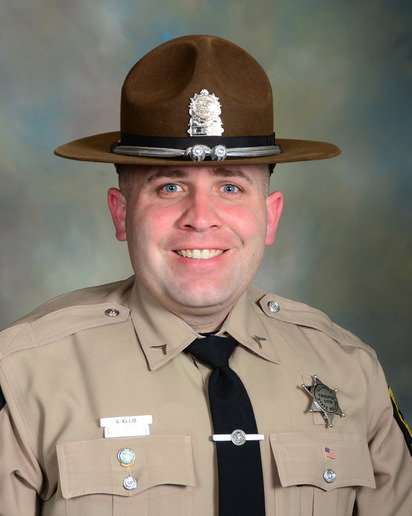 Trooper Ellis was 36 years old and an 11-year veteran of the Illinois State Police. Ellis is the second ISP trooper to be killed in the line of duty in the span of under three days. Trooper Brooke Jones-Story was struck and killed by a tractor-trailer while conducting a traffic stop. Trooper Jones-Story had served with the Illinois State Police for 12 years.